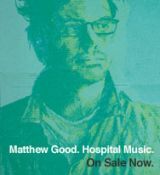 British Columbia’s Matthew Good will be performing at the Marquee Club in Halifax on Thursday October 11th in support of his new CD, Hospital Music. The show will be an intimate acoustic show with special guests Dala (doors open at 9pm). “I remember being in the shower drinking a beer thinking to myself that something wasn’t right. It didn’t cross my mind at the time that the reason for my state was of my own doing, just that I felt terribly wrong. And as I sat on the floor of that shower, feebly trying to block the water from getting inside that can of beer, I thought to myself – how did it come to this? To the majority, the success that I have enjoyed, or my profession alone, would be cause for celebration. Fame, the perceived wealth and perks that come with it, the friends and the constant attention, are bizarrely appealing to many in our society today, so much so that one of the most popular current pop-culture phenomenon’s at present is a television show which thousands of people audition for in hopes of being handed fame, fortune, and all of the supposed trappings that come with it. Somewhere in there, between trying to comprehend the desire of contestants to use whatever means necessary to assuage their desire to secure fame, and the numbness I felt sitting on the floor of that shower, I started to think about Nick Drake. I have been a fan of Drake’s work for a considerable amount of time, but what has always impacted me the most about him was his lack of success despite his brilliance and the circumstances under which he suffered that caused him not only to produce the material that he did, but kept him from becoming something that many could gravitate towards because of the need of others to match talent with the desire to project the enjoyment of celebrity. Nick Drake suffered from depression and extreme insomnia, and in his later life refused to leave his parent’s home in Far Leys. Drake would eventually take his own life in 1974, though there are some in his family that believe that he had simply tried to take the medication that he was on to help him fall asleep and, in a state of confusion, had taken more than he should have. Given where I find myself now, months after that night in the shower, I like to think that that was the case. Because the reason that I was in that shower that night is that I had done the exact same thing. I don’t remember what happened afterwards. I don’t remember being carried out of my parent’s house by paramedics or being in emergency. I don’t recall the blur of words to the paramedics in the ambulance on the way to hospital, some of which pleaded with them to let me pass. All I remember is waking up, the white lights of the room, the feeling that washed over me when certain individuals that had been prevalent in my life were not there nor would come to the hospital during my stay, and the feeling that I had reached a point in my life where everything that I was represented little more than a prison from which I could not escape. My divorce, its betrayal, the usury, the falseness of those that had surrounded me for so long had constructed a wall in front of me, one which I would daily stand before unsuccessfully attempting to engineer a way over. To most, these things are not conditions of fame and success. In fact, many would argue that to hold in contempt all that I have achieved is disgraceful, as most would, in a heartbeat, trade places with me in a second. But you see, that is where the difference lies between those for whom art is akin to breathing, be it for the better or worse, and one in which notoriety is the focus. I would later discover that, like many others, I suffer from bipolarity, which when placed in the context of the creative is both a blessing and a curse. But it is not for others to say what is and is not acceptable when it comes to how one views success in what I perceive as the arts and the majority perceives as entertainment. That, in and of itself, is what separates the Nick Drake’s of this world from those contestants that battle to impress a panel of judges and a television audience. For the Halifax show, tickets are $25 in advance and $30 at the door and go on sale Thursday August 2nd at 10am. Tickets will be available at all Ticketpro Outlets - (Alderney Landing Theatre, Greenlyph Computers, Halifax Forum, United Bookstore and Newsbreak Café & News Stand at Lady Hammond, Clayton Park, Ilsley and Windmill), charge by phone 1-888-311-9090, or online www.ticketpro.ca. The show is restricted to ages 19+ and doors open at 10 pm.